TMA and whole section image repository is located here. Tissue microarray technology holds great potential for reducing the time and cost associated with conducting investigative research in cancer biology, oncology, and drug discovery. TMA’s make it possible to construct a carefully planned array such that a 20-year survival analysis can be performed on a cohort of 600 or more patients using only a few micro-liters of antibody. However, capturing, organizing, updating, exchanging, and analyzing the data generated by this technology creates a number of significant challenges. The sheer volume of data, text, and images arising from even limited studies involving tissue microarrays can over time quickly approach those of a small clinical department. The central objective of this revised renewal application is to (1) build upon the progress made in the first phase of research by expanding the reference archive of imaged TMA specimens and correlated clinical data to include a wider scope of malignancies, tissues and biomarkers; (2) develop advanced imaging, computational and data management tools to support automated analysis of tissue microarrays in collaborative frameworks; and (3) increase dissemination of the query-enabled image archive and imaging and data management tools to the clinical and research communities for research, education and clinical decision support. The aims of the proposed project will be achieved through the development and implementation of advanced computational, imaging, and pattern recognition tools and new technologies. Public health relevance: Tissue microarray technology holds great promise for advancing investigative research in cancer biology, oncology and drug discovery. The overarching objective of the proposed project is to develop a suite of algorithms and software tools which facilitate automated imaging, analysis, and archiving of tissue microarrays. 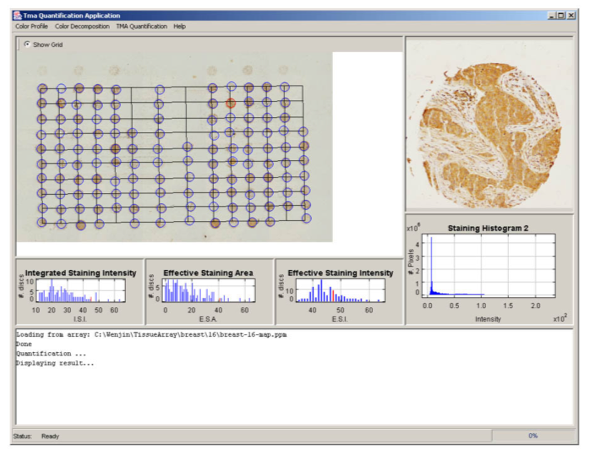 The key computational and imaging tools that were developed in the first phase of the project including a color decomposition algorithm for analyzing the staining characteristics of the histology; image analysis tools for automatically computing the integrated staining intensity, effective staining area and effective staining intensity of expression patterns; an intelligent image archiving system; caBIG compliant data management tools; a reference library of expression signatures for more than 120, 000 imaged tissue discs originating from a mixed set of cancer tissue microarrays; and a new texture descriptor based on region covariance which was shown to provide quick, reliable performance for identifying and delineating tumor regions and performing antigen localization at the tissue level. The central objective of this revised renewal application is to build upon the progress made in the first phase of our research by (1) expanding the reference archive of imaged specimens and correlated clinical data to include a wider range of tissues, cancer types and biomarkers; (2) building upon our prior work by integrating a vendor-independent interface to the TMA analysis and data management toolset to support a full range of commercially available virtual slide formats; (3) investigating the use of a new repulsion force term to be used in conjunction with the existing internal and external energy equations for improved accuracy in delineating boundaries in regions exhibiting dense, concentrations of cells; (4) integrating a variable channel module into the segmentation algorithm and evaluate its capacity to support multi-dimensional image data; (5) building upon our successful efforts to design, develop, and evaluate a quick, reliable approach for performing unsupervised, deformable co-registration of consecutive histological sections to facilitate analysis across multiple experiments and correlate image features across adjacent sections; (6) deploying the updated software suite, data management tools and query-enabled reference archive of imaged TMA specimens to the consortium of adopter sites and assess performance using quantitative imaging experiments and a newly developed man-machine comparative analysis software toolkit. Upon completion of the project the archive of imaged specimens, computational and data management tools will be made available to the clinical and research communities as shareable resources for collaborative research, education and clinical decision support.